and friends of the workshop. Illinois Wesleyan University has unusual success with its course, "Problems of Nuclear Disarmament." It deals with what journalists have voted to be "The Story of the Century." Students apparently wish to know about their futures and the challenges they may have to face. The instructor (RGW) began teaching about the effects of nuclear war in 1959. He has spent eight summers of study in Hiroshima. In 1979 the Problems of Nuclear Disarmament course was created. Perhaps on your campus there already exists a course which deals with the problems of nuclear war, and the social, biological, and physical effects on the cities and people of Hiroshima and Nagasaki wherein the death toll was well beyond 200,000. We believe such courses are rare. Was one available during your college days? We further believe that college teachers can develop unique understandings and approaches to the problems brought about by contemporary threats to world peace and by nuclear weapons. In 2002 and 2003 this one-week Workshop was offered solely for physics teachers. It is now available to all college teachers. Contact Ray Wilson at rwilson@iwu.edu if you are interested in participating in this workshop. We will supply additional information. Nagasaki: R. G. Wilson and Sumiteru Taniguchi, June 2001. Inset: Taniguchi-san, January 31, 1946, age 16, a "miracle" to survive. 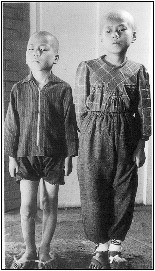 Epilation from radiation: Brother and sister of Hiroshima - Did they survive? Some of the Topics of the 3-week May Term "Problems of Nuclear Disarmament". "Media, public agree: Atomic bomb story of century"
Students: Is this is something you should know about? "Problems of Nuclear Disarmament is a May Term (short term) course of 3 weeks duration, for IWU students, meeting 5+ hours per day. Students enroll for only one course during May Term. There are no prerequisites. The course meets a general education requirement, and awards "flag credit" for the requirement of Encountering Global Diversity. As you can see, in the 3-week course we begin with classic fundamental concepts and work our way through to the modern; but additionally, throughout the course there is a parallel and simultaneous development of: the science and technology of nuclear war; and the social, economic, ethical, human, political and international implications of the nuclear weapons policies of nations. Many other resource books will be available. Physics topics below will be treated appropriately for all. Origin of the universe; our nuclear origin. The four forces of nature and the energies associated with them. Bohr theory of the hydrogen atom, energy from atoms. Spectral analysis demo. Radioactivity. Demo's: Cl-36, lantern mantle, clock dial, trinitite, etc. Appropriate nuclear physics and nuclear energy. Nuclear testing: Effects on the Japanese, Pacific islanders, U.S. downwinders, and at Semipalatinsk. The world at war, ~1939-1945. BBC "World at War: Japan 1941 - 1945," "Hiroshima," "The Day After Trinity"
The Hiroshima/Nagasaki experience. Ibuse's "Black Rain," "Prophecy," "Barefoot Gen," "A Mother's Prayer"
Japanese and U.S. political conditions during the last months, weeks, of WWII. 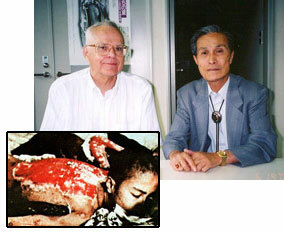 Physical, biological, social ramifications for hibakusha; Japanese government response and responsibility. In Defense of Nuclear Weapons. Oppenheimer's Conjecture on World Peace. Understanding the many aspects and implications of a war of mass destruction: Should U.S. policy continue to expend massive resources on new military preparedness and defense, or is there some way those same resources could be used to eliminate the need for weapons of mass destruction? If life in the U.S. and in the Developed World is good now, how much better could it be throughout the world if there were no threats of war or mass annihilation for all nations? What shall be the story of the 21st century, nuclear war, or peace, or . . .? The linkage of the topics above to public policy is best illustrated by considering the questions and tasks which can arise in the 3-week course. The questions and tasks are handled in a variety of ways: in class and out of class, individual expressions or group consensus, detailed investigations of specific nuclear catastrophes, and short papers. During the first minutes of the course, students are confronted with the question of use of atomic bombs on Hiroshima and Nagasaki, are asked to consider the Christian perspective on this question and what this means in terms of national policy. This question can arise several more times as students come to a full understanding of the reality of nuclear war. The three week nature of our course limits extensive research into nuclear and nuclear policy problems. This places considerable responsibility upon the instructor to provide appropriate course material and have it all readily accessible, and still leave an open door for students who wish to tackle a problem of personal importance to them. Most, if not all students, will have an incomplete understanding of nuclear effects, nuclear policies, and what happened in our first nuclear attacks upon Hiroshima and Nagasaki. The instructor attempts to provide a base of understanding, but the social, ethical, and political issues continue to remain very much open to debate. Our intention is not to reach any consensus, but to inform, and indeed inform of the viewpoints and new concepts of world policies that will affect students' lives over the next century. A course Reference bibliography is available. Following, are some typical problems, issues, and ideas with which students can "wrestle." It will be noted that some relate to past events which may continue to influence current and new policies. 1. Have there been any world conflicts in the years following WWII that would justify use of nuclear weapons? If nuclear weapons save lives and end wars sooner should they have also been used in Korea and Vietnam. Why were they not? 3. At the course mid-point: Write to parent(s) or significant other describing how your new understandings of nuclear war and policies have affected you. How have you changed? Compare what you understand now with your knowledge at the beginning of this course. What international nuclear policies are acceptable to you? 4. Should the United States attempt the construction of a barrier to nuclear attack? Would such be possible? Would it be affordable? Is the creation of a fortress America a proper approach to this international problem? Who is to be saved? 22 - 30 years after WWII? Why do you believe this was done? In this world of modern communications could such information in a new situation still be withheld? Have you seen the effects on people from recent wars in Africa, Afghanistan, and Iraq? Are depleted uranium (DU) warheads really as dangerous as some believe them to be? 8. Discuss, critically comment on Wilson's paper, Peace: A New Way of Thinking about Achieving and Preserving It. Could this lead to a Manhattan Project for World Peace? Can you conceive of a program of shifts in international relations that could likely assure: peace, justice, prosperity, and fairness for all nations? Of what would such a program consist? What protection and assurances would you require?